The goal of this overview is to introduce the general concepts in CakePHP, and give you a quick overview of how those concepts are implemented in CakePHP. If you are itching to get started on a project, you can start with the tutorial, or dive into the docs. CakePHP provides a basic organizational structure that covers class names, filenames, database table names, and other conventions. While the conventions take some time to learn, by following the conventions CakePHP provides you can avoid needless configuration and make a uniform application structure that makes working with various projects simple. The conventions chapter covers the various conventions that CakePHP uses. The Model layer represents the part of your application that implements the business logic. It is responsible for retrieving data and converting it into the primary meaningful concepts in your application. This includes processing, validating, associating or other tasks related to handling data. You may notice that we didn’t have to write any code before we could start working with our data. By using conventions, CakePHP will use standard classes for table and entity classes that have not yet been defined. The View layer renders a presentation of modeled data. Being separate from the Model objects, it is responsible for using the information it has available to produce any presentational interface your application might need. // In a view template file, we'll render an 'element' for each user. The View layer provides a number of extension points like View Templates, Elements and View Cells to let you re-use your presentation logic. The View layer is not only limited to HTML or text representation of the data. It can be used to deliver common data formats like JSON, XML, and through a pluggable architecture any other format you may need, such as CSV. 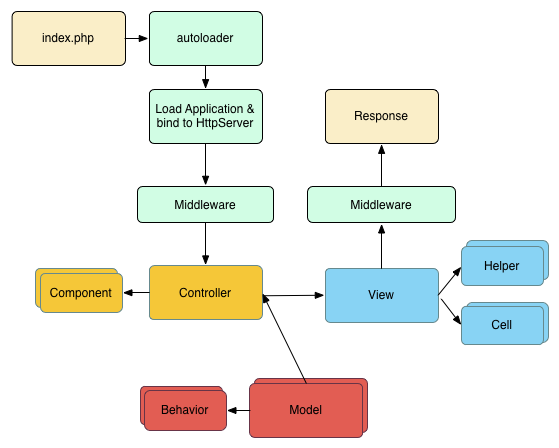 The Controller layer handles requests from users. It is responsible for rendering a response with the aid of both the Model and the View layers. You may notice that we never explicitly rendered a view. CakePHP’s conventions will take care of selecting the right view and rendering it with the view data we prepared with set(). The webserver rewrite rules direct the request to webroot/index.php. Your Application is loaded and bound to an HttpServer. Your application’s middleware is initialized. A request and response is dispatched through the PSR-7 Middleware that your application uses. Typically this includes error trapping and routing. If no response is returned from the middleware and the request contains routing information, a controller & action are selected. The controller’s action is called and the controller interacts with the required Models and Components. The controller delegates response creation to the View to generate the output resulting from the model data. The view uses Helpers and Cells to generate the response body and headers. The response is sent back out through the Middleware. The HttpServer emits the response to the webserver. A caching framework that integrates with Memcached, Redis and other backends. Powerful code generation tools so you can start immediately. Integrated testing framework so you can ensure your code works perfectly. The next obvious steps are to download CakePHP, read the tutorial and build something awesome.